Comfortable and Easy to Use - The VerticalMouse C features contoured sculpting that offers users with average to large size hands both comfort and support. The fully programmable buttons are optimally placed, eliminating finger stretching and contortions. Maintains Blood Flow through the Wrist - Conventional horizontal mice cause your forearm to twist away from its natural position, which can reduce blood flow, contort muscles into awkward positions and increase the rate of fatigue. For many, this can result in discomfort and pain while mousing. 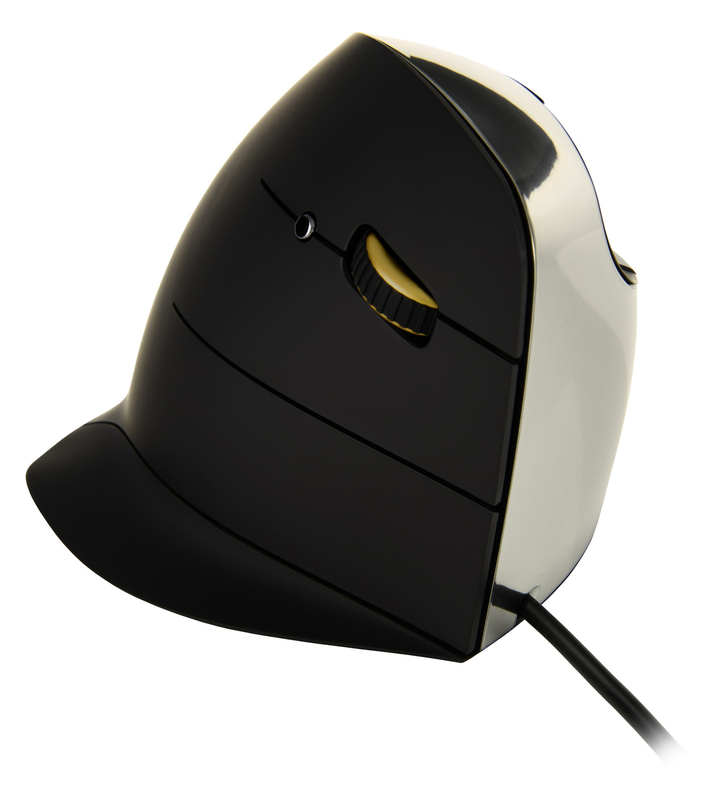 A "vertical" mouse encourages users to maintain a neutral wrist alignment which can reduce or eliminate potential circulation restrictions. 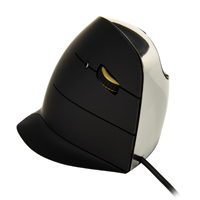 Eliminates Forearm Pronation - The design of the Evoluent VerticalMouse C improves comfort and control when mousing, with a patented shape that supports the hand in a relaxed handshake position, and a sculpted “notch” for your thumb to rest in. This innovative design eliminates forearm twisting and minimizes the effort required to use the mouse. Can Reduce or Eliminate Wrist Extension - Traditional mice require that the hand be in a facedown position on the mouse. Users tend to plant the heel of their hand on the mousing surface and then attempt to move the mouse with the thumb and pinkie or ring fingers. This puts the wrist into a position of extension which can lead to painful RSI. The Evoluent VerticalMouse C addresses this by rotating the hand away from the desk, eliminating the tendency to "plant" the hand. 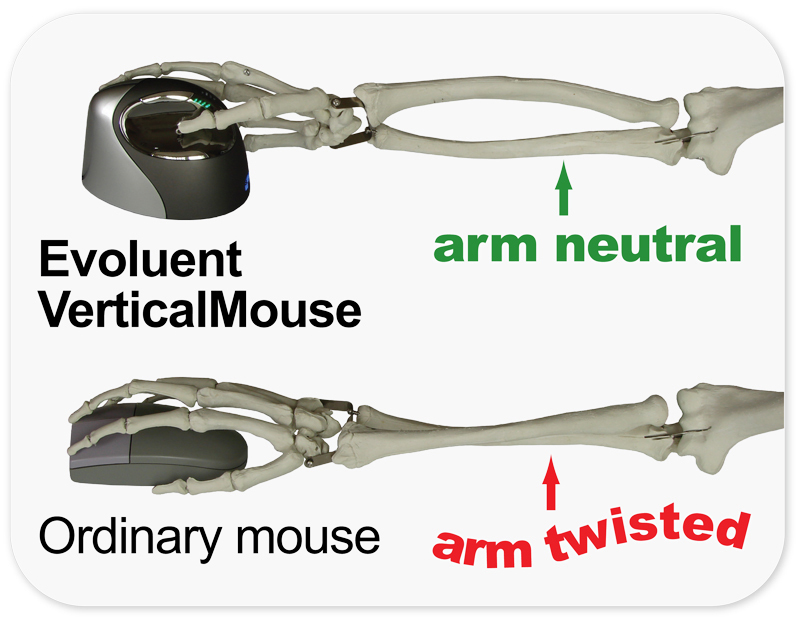 While users can still create some wrist extension by flexing their wrist for left/right movements this can also be easily addressed by learning to move the Evoluent VerticalMouse with the arm rather than the hand. Can Address Tennis Elbow (Lateral Epicondylitis) - The vertical orientation into which the Evoluent VerticalMouse C rotates the hand is intended to address excessive tension which is put on the tendons and tissue of the forearm when the hand is rotated into the facedown position common in both mousing and keyboarding. This tension is known to commonly manifest in what usually referred to as "tennis elbow", when inflammation develops where the tendon attaches to the outer edge of the elbow. Eliminating the tension by addressing the pronation issue permits the tendon to relax and as the attachment point is no longer under continuous stress the tissue is permitted to rest and heal. Reduces Potential for “Anticipation of the Click” and Eliminates Finger Extension - The ergonomic design and low click force of the Evoluent encourages the user to let their fingers remain "at rest" against the buttons, rather than hovering over them in anticipation of clicking. Since the fingers can relax against the mouse there is no hovering or stretching action of the fingers which can lead to development of Trigger Finger. Almost No Learning Curve - Users employ the same familiar hand position as with an ordinary mouse (just turned sideways), and the buttons are operated by the same fingers. This virtually eliminates any need to retrain or establish new muscle memory when mousing. Cursor Stability - The mouse does not unintentionally move sideways when clicking with normal force because the thumb is positioned to naturally oppose the finger movements. Pointer Accuracy - Pointer control is as accurate as any other high-quality performance mouse with on-mouse adjustable speed controls. Encourages Load Balancing or Spreading Software Option - Mouse Manager for Windows (Microsoft Certified) or MAC OSX offers extensive custom, and even contextual, programming options yet is still easy to use through a simple and intuitive interface. Users have the option of reassigning button commands for load balancing or duplicating commands on multiple buttons in order to spread the load across multiple digits. Offers Alternative Clicking Options to Reduce Repetition - Automatically perform a single or double click by pausing the pointer. The time delay before activation is adjustable. OR, Alternatively reassign commands to a different button or multiple bottoms to lighten or spread the clicking load. Note: Evoluent Mouse Manager Software required. Provides Alternatives to Static Strain For Click-Drag Operations - Press and hold a button momentarily to simulate continued pressing without holding down the button. The time delay before activation is adjustable. Note: Evoluent Mouse Manager Software required. Break Reminder Option - Set up visual and/or audio alerts to remind you to take a break. Note: Evoluent Mouse Manager Software required. Adjustable Laser Sensor: A pointer speed button on the side allows convenient adjustment without changing the position of the hand on the mouse. Pointer Speed Indicators: Top mounted LED-illuminated indicators show through the housing on the thumb rest to advise users of the selected pointer speed. 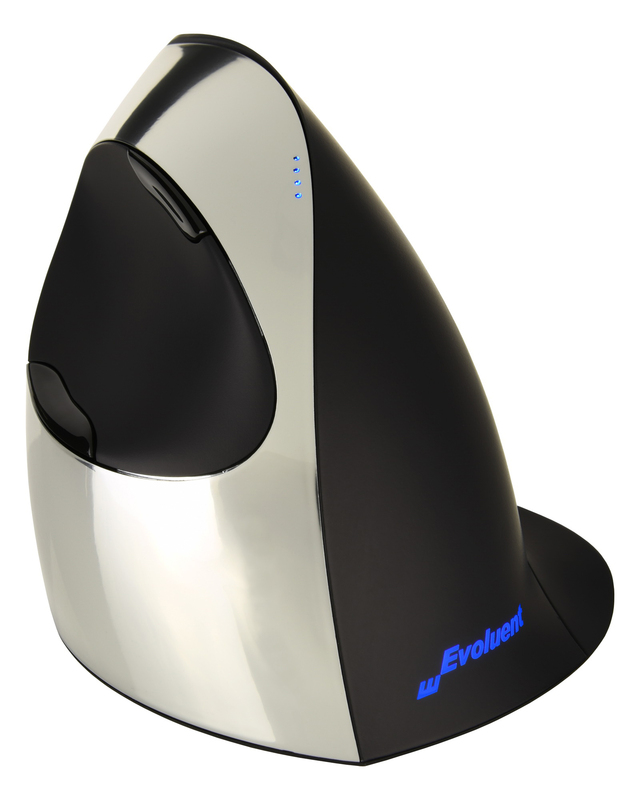 Back-Lit Evoluent Logo: A purely cosmetic feature which adds to the lustre and modern look of this mouse. The illumination turns off to conserve power when the system is in sleep mode. Useful and Intuitive Driver: Mouse Manager for Windows (Microsoft Certified) or MAC OSX offers extensive custom, and even contextual, programming options yet is still easy to use through a simple and intuitive interface. Refined Ergonomic Contours: The Evoluent VerticalMouse C features clearly defined lines to encourage correct hand placement. The buttons on the Evoluent VerticalMouse C are now seamlessly integrated into the housing, ensuring the fingers are able to comfortably rest against the contours of the body as it curves in towards the front of the mouse. The gently countoured thumb well cradles the thumb so the hand remains in position for optimal cursor control and balanced clicking. 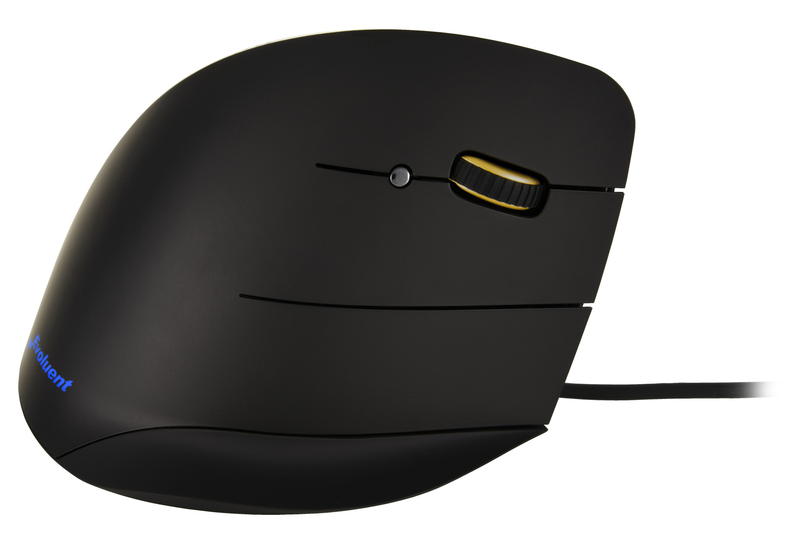 The extended lines of the buttons on the Evoluent VerticalMouse C provide improved finger support for those with long fingers or larger hands. Extended Finger Flange: The Evoluent VerticalMouse C features a large finger flange designed to prevent the fifth finger from dragging on the desk. This flange is noticeably wider than that on earlier Evoluent models and has a slight upward curve to encourage the pinkie finger to remain securely in place. Wireless Option: The Evoluent VerticalMouse C is also available in a Wireless format which is compatible with both PC and Mac operating systems. Scroll Wheel: The Scroll Wheel has a central grooved soft rubber surface and offers smooth movement with gentle detents. Speed Toggle: Move up or down through the 4 pointer speed settings with easy-to-access side button and clearly visible illuminated indicators. Quality Ergonomic Design: The Evoluent VerticalMouse C is engineered with a high quality sensor coupled with the low button activation force for which the Evoluent is known. Button action and vertical scroll wheel movement is smooth, consistent and precise. The new contours of the Evoluent VerticalMouse C improve usability for those with larger hands or longer fingers while still providing the comfort and relaxed hand position for users with average sized hands. Relaxed Handshake Position: The ergonomic contoured shape of the Evoluent VerticalMouse C supports the hand in a natural handshake position that eliminates forearm twisting. 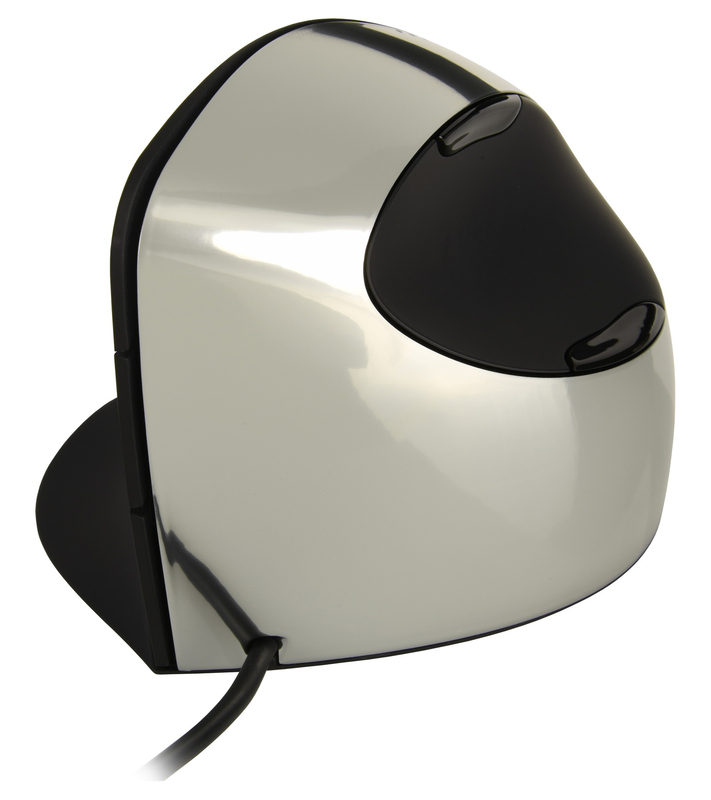 Users employ the same familiar grip as with an ordinary mouse, but in a vertical orientation, so almost no retraining is needed. Clicking the mouse buttons does not result in unwanted movement because the thumb naturally opposes other finger movements. Light Tactile Buttons: The buttons on the VerticalMouse C take about half the force of traditional mice to click, so your fingers won't get tired with the high frequency of clicking required in programs. The button force is low for easy clicking, but still retains sufficient tactile firmness to avoid accidental actuation. 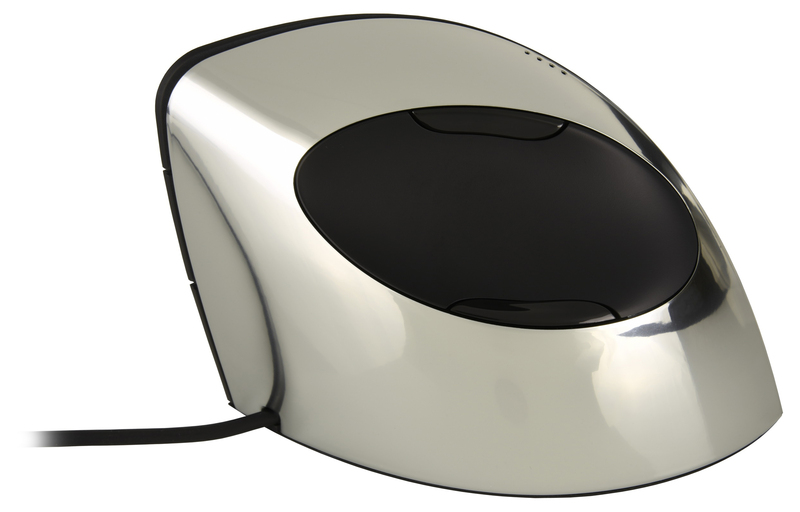 Five Fully Programmable Buttons: The VerticalMouse C provides a total of 5 buttons, two thumb operated and 3 finger operated. 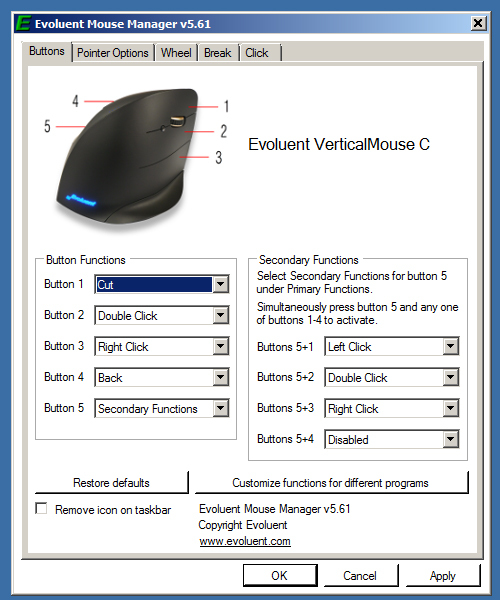 Note: Unlike earlier versions of the Evoluent VerticalMouse the scroll wheel on the VerticalMouse C is NOT clickable. Mac drivers on the Evoluent download page may be used to program the buttons. Colours: Black Housing with Silver Chome accents, Blue light for Evoluent logo, Blue DPI setting indicator.